This entry was posted in Autism, communication, Folk Tales and tagged Autism, autistic, communication, creative writing, folk stories, folk tales, non speaking autistics, non-speaking, Rapid Prompting Method, RPM. Bookmark the permalink. Emma continues to amaze me daily. Happy 12th birthday Emma. Miss you today at school but enjoy your day with mom. Thank you so much, Susan. Em wrote that she wants me to take her shopping and help me bake a cake! Happy Birthday, Emma! That’s a lovely story (and better than many stories I’ve seen written by “professional” authors). The moral of the story is definitely a good lesson for all of us to learn, but especially for those whom the world sees their different as being less. Does Emma want to learn to type or does she prefer using the stencil board? She is typing on an independent keyboard that is hooked up to an iPad with someone she sees once a week. She is not able to yet with me, but that is the goal eventually. Nick is meeting with Chase from Remington and Oliver from Harrisonburg today to practice typing. I would love to read this story to them as a writing prompt. May I have your permission? Happy Birthday Emma, what a beautiful story! Happy Birthday Emma, you with your beautiful brain and your warm heart are changing lives. Have a fabulous day. (From Ariane) Thank you Shenny. Off to make pancakes for breakfast! Happy birthday Emma! Thanks for your story, your birthday gift to all of us “fans”! FABULOUS story — beautiful idea and beautifully written. A very HAPPY 12th BIRTHDAY to you, Emma ! Thank you for your story ! Beautiful story! It could be made into a children’s story book with pictures. Happy birthday, Emma! Chou Chou! Love the image of you with webbed feet slapping around in your garden’s mud! Happy Birthday Emma!!! Hope your day is all you wish for. Beautiful story, writing, wording, and moral. Happy birthday Emma from my E and myself 🙂 hope you have a wonderful day! Happy birthday, Emma! 🙂 I like your story, it is pretty awesome. Beautiful story Emma!! You are taking the world by storm and you are teaching so many people how to live a life of non judgment, of happiness, of inclusion, of acceptance and of embracing one’s uniqueness!! You are turning 12 today yet already you have taught more than probably many kids your age! I wish you all the best today and always Emma!! Happy Birthday Beautiful Girl! (The proud father beaming like a supernova). You are such a wise and wonderful writer. Every day is a better day with you in it! Can’t wait to see what you write next! Happy 12th Birthday, Emma! Thank you for sharing your wonderful story on your special day! Happy birthday, Emma! My girl is 12 and autistic, too. Thank you for sharing your story. When she wakes up, I’ll let Kayli read your story. Happy Birthday, Em… I hope you have a spectacular day! Thank you for the gift of your words. I plan to share your story with H.
Happy stepping….into your 13th year, Emma. Welcome to the world, we love your insight! Happy Birthday to Em from the land of Ibbia, where she is missed, and her stories are greatly prized along with her singing! Happy Birthday, Emma! Thank you for sharing. I love this story and all your other writing. Wishing you success and happiness. HAPPY BIRTHDAY darling Granddaughter! What an awesome story and such a profound metaphor on loving oneself and not being judgmental. That is a wise old owl indeed! Happy Birthday Emma. What a wonderful story. I’m so happy you are sharing your writing with the world. It is not just that you write well and tell a good story, you also have many important messages to share with us. You are touching people’s lives I can’t wait to read more. Thank you, Emma, for this beautiful story and happy birthday to you. Have a great day! Happy birthday, Emma! I began writing at eleven years old. Now, at fifteen, I’m working on my first novel. Who knows where you may be in a few years? Happy Birthday Emma. What a beautiful story! Not only are you an amazing writer but an amazing teacher- especially to those of us that are parents of autistic folks. When Joey came home from school I told him it was your birthday, Emma and that you and your mom were going shopping at Macys at your request. Here is what Joey (17) wrote on his letter board to you!! TODAY IS YOUR HAPPY AND JOYOUS BIRTHDAY. I’M WRITING TO WISH YOU THE BEST BIRTHDAY EVER. WONT YOU SHOP SO HARD TODAY AND PLEASE PICK OUT SOMETHING THAT YOU THINK IS TOTALLY RADICAL. TODAY THE MOST IMPORTANT THING IS THAT YOU ARE HAPPY. Happy Birthday Emma! Your story is awesome. I’m re-blogging it, as well (hopefully that is okay). It’s a very valuable lesson that I think everyone should read and hopefully learn from. Have a great birthday! Wonderful story with a very valuable lesson from Emma (today is her birthday – so you should also go to the page this blog originates from and wish her happy birthday). owe, i love it. i’m going to twitter and pintrest it, lol. 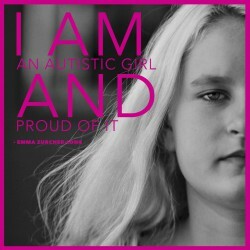 our beautiful autistic minds, and Emma, just like the duck’s lovely feet, don’t fit into society. that shouldnt cause a person to feel bad about the way he/she is. i was made to feel inferior because of it, but after visiting forums and blogs like this one, i now know i’m unique and special. Emma knows that, and she’s a great story teller with a bit of poetic twist. Happiest of birthdays to Emma, sorry to be late in my wishes! And a most marvelous story! Happy birthday, Emma! What a beautiful story. Ariane, this is such a wonderful story. I have never before written you to tell you how much I love your blog, but I am telling you now!! Emma is absolutely amazing and wise beyond her years. I first discovered your blog when I gogled “Walter Paepke” as my father (George Sill) worked for him in sales for 33 years at Container Corporation. My parents attended some parties at their home in Kenilworth, and my mother always said what charming people they were. So, even though we have never met, I feel we have some sort of connection, and I love reading about you and your wonderful family.